I'm home from seeing baby's little heart beating away on the screen (172 beats per minute) along with little kicking legs and flailing arms. What a relief! I'm always so nervous until I see that little form come into focus on the screen! Baby measured right on track for our dates and is still expected to arrive sometime around the 18th of October. And as far as the spotting goes (the reason for the ultrasound) they could see two places where the placenta hasn't attached, which is likely the cause. The ultrasound tech didn't say much more than that and didn't seem too worried. I'm less worried since the same thing happened at 6, 10, 16 and 20 weeks with Patch, and the memory of that keeps me from worrying too much. So here's a picture of our little peanut growing! What a sweet little gift :) I honestly thought there were two little babies in there!! Congratulations! So glad everything is going well! So your uterus looks heart-shaped. Do you technically have what is called a heart-shaped (bicornate?) uterus? Or is that just the picture? Just curious because I'm kinda a nerd about those things. I'm not sure but now I'm totally curious too because it does look like a heart in the pictures (and I'm looking at the picture we have of Christian up on the wall at 12 weeks and that one looks like a heart at another angle too!). And I totally was almost surprised there was only one in there too, LOL! Although she told me that the cysts that they saw the last two times with Patch and Christian would have been from more than one egg rupturing (there were a ton with Patch) and so it's a definitely been a possibility I guess! Yay! All good news! Yeah, you and Dwija I keep waiting to see if there is a twins announcement.. lol. Congratulations!!! I'm do happy everything is looking goid. And I totally thought this was photoshopped somehow because of the heart shaped uterus! So very cool! Wonder if your uterus shape could have anything to do with showing early? I know mine is twisted, this shows up on ultrasounds, and manifests in the third trimester as me being much more pregnant on the right side than the left (people comment on how lopsided I am). Also, did they try to determine baby's gender? I have always had a twelve week scan, the first four were at a stand alone place, and all they did was determine health for the first three, and sadly that our fourth had passed away a few days prior. But for the fifth, since I was over 35 and officially "advanced maternal age" they sent me to the antenatal testing center at the hospital, which had better ultrasound equipment, so we got amazing pictures at 12 weeks of all the brain sections, the spine, the heart chambers, and that it was a boy. 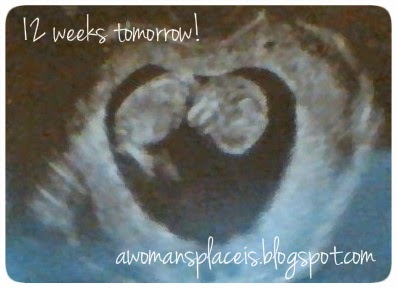 I love ultrasound pictures, especially now that they are all we have of our forth.